So Qatar is too hot in summer after all. And at 40-50C in the shade, who can disagree? Even if the stadia are cool enough, the outside won't be, and the prospect of a million beer-hungry fans stumbling out into such a furnace in desperate search of a cool lager does not bear thinking about. 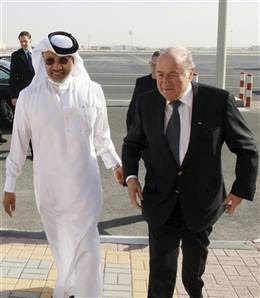 "I support definitely, definitely," Sepp Blatter said,"to play in winter here, to play when the climate is appropriate." The FIFA President's support for a January World Cup in 2022 appears clear enough. The temperatures in the summer months in Qatar are far more oppressive than their anti-alcohol or anti-gay laws, that is for sure. Playing in the Middle East's winter makes sense therefore, when the thermometer rarely rises above 25c by day and has an average low of a pleasant 13C. And Qatar has already successfully hosted big-name games of football outdoors at that time of year. But avoiding the sweltering summer and the need for expensive and unproven technology has a serious downside to it - a sandstorm brewing in club boardrooms across Europe all of FIFA's making and the spectre of an almighty club v country conflict on the horizon. Blackpool manager Ian Holloway, famous for his juicy quips to the press, was typical of the domestic reaction when he launched a fiery tirade at the possibility of the football season closing down for two months to make up for FIFA's initial error. Holloway likened switching the World Cup to the European winter as akin to changing the date of Christmas. "So we'll just change everything cos your weather's really hot,"he said. "Brilliant! I mean come on, what's going on? What happened to the air-conditioned arenas. Bit too expensive 25 of them was it or what?" It was Franz Beckenbauer who first publicly floated the idea of switc hing the month of the tournament, closely followed by nods of approval from UEFA President Michel Platini, FIFA General Secretary JeromeValcke and then Blatter himself: This hitherto unthinkable idea now has legs. FIFA's own technical evaluation of the hosting bids, even though it was blithely ignored by the Executive Committee, marked Qatar as "high-risk" on account of its hellishly hot summer - "a potential health risk for players, officials, the FIFA family and spectators". As it stood, the arena temperature would still have only been 27C at its coolest. 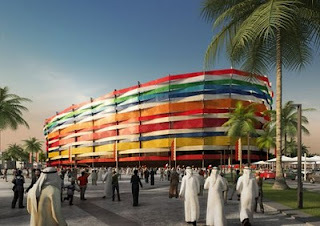 But clearly the assurances that (carbon-neutral) air conditioning, powerful enough to cool a dozen big stadia and presumably 32 more for the finalists to train in, will be ready in time for 2022, are seriously doubted in Zurich, only two weeks after they made the controversial choice of a Middle Eastern summer host. Now the vote is over, Blatter has also mentioned moving the Qatar World Cup into other Middle Eastern countries, surely against the spirit, if not the rules, of the bidding campaign. While staging matches in neighbouring countries such as the United Arab Emirates would not be disastrous, the move from June to January potentially is as it places the international game in its most direct opposition yet with the clubs they have been trying to placate for the past two decades. Clubs are so far aghast at the prospect of having their leagues shut down by FIFA for a two-month hiatus and watching their best players come back jaded and/or injured mid-season. The risk FIFA runs is rebellion against its plans from the big European teams, leaving the governing body to think the unthinkable, recall the 2022 vote and select the USA, the runner-up, as host instead. A stand-off could increase the already floated idea of a breakaway from FIFA led by major European nations, or at the very least, herald big concessions in the form of exemption from friendlies for top players or compensation paid by FIFA to cl ubs for borrowing their star men for international duty. Instead of global harmony appearing around the 2022 World Cup decision, awarding the tournament to Qatar has created global warming of a different kind, and there appears no ready solution besides cancellation of the hosting. It's another fine mess from Sepp & Co.
"FIFA is not just lobbing a pebble into the club waters, but a huge chunk of granite hewn from the Matterhorn."